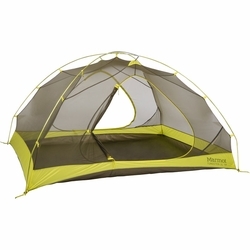 Marmot Tungsten UL 3P Tent. Ease the cramped style of tight tent quarters with the space-maximum Tungsten UL 3P. More space per ounce than any of Marmot's other free-standing tents, this puppy is the premier in roomy tent living with convenient features like two-D shaped doors, two vestibules, and a no-stretch Rain-Shield polyester fly.